My friends, we have come together on Trinity Sunday to celebrate the Eucharist during which the Sacrament of Confirmation will be conferred. Through Confirmation, our candidates will be strengthened by the Holy Spirit to give witness to their faith as disciples of Christ. …And so, brothers and sisters, let us acknowledge our sins, and so prepare ourselves to celebrate the sacred mysteries. We have learned that on the day of Pentecost the apostles received the Holy Spirit as the Lord had promised. They also received the power of giving the Holy Spirit to others, and so completing baptism. And this power to Confirm the baptised has been handed down throughout the ages by the Church. This means that today our candidates will be sealed with the same gift as at Pentecost! It is more than being baptised in the name of the Father; of the Son; and of the Spirit. Each sacrament of initiation is particular to a Person of the Trinity. Through baptism we cry out Abba, Father! The Eucharist is particular to Jesus whose Body and Blood we consume. 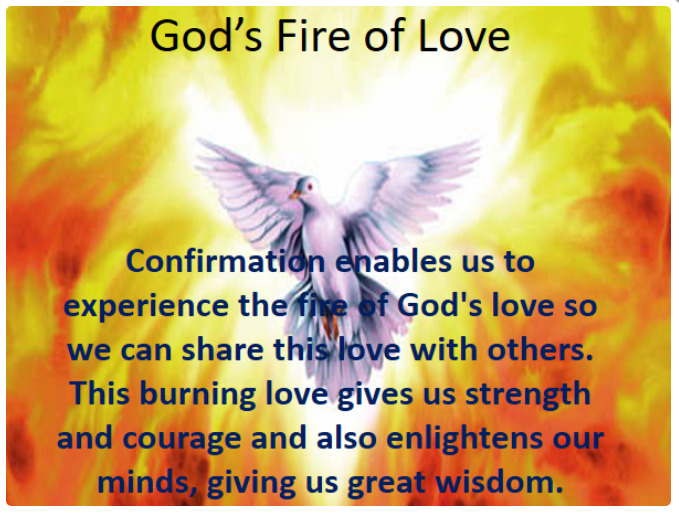 Through Confirmation we enter into a personal relationship with the divine Person of Love. That is why the coming of the Holy Spirit in confirmation fills our hearts with the love of God, brings us together in one faith (but in different vocations), and works within us to make the Church one and holy. The gift of the Holy Spirit which you are to receive will be a spiritual sign and seal to make you more like Jesus and more perfect members of his Church. At his baptism by John, Christ himself was anointed by the Spirit and sent out on his public ministry to set the world on fire. You have already been baptised and now you will receive the power of the Holy Spirit and the sign of the cross on your forehead. You must be witnesses before all the world to Jesus’ suffering, death, and resurrection; your way of life should at all times reflect the goodness of Christ. Jesus gives various gifts to his Church, and the Spirit distributes them to build up the holy people of God in unity and love. Be active members of the Church, alive in Jesus Christ. Under the guidance of the Holy Spirit give your lives completely in the service of all, as did Christ, who came not to be served but to serve. So now, before you receive the Spirit, I ask you to renew the profession of faith you made in baptism or your parents and godparents made in union with the whole Church.